•	Before using your new plancha, wash it with warm soapy water and a plastic brush or scrubber to remove any factory grease or dirt. •	Dry well, then wipe it generously and evenly on both sides with vegetable oil or shortening. •	Heat the plancha in a grill set up for indirect grilling or bake it in a 300 degree oven until the oil is absorbed by the pores in the metal, 30 to 60 minutes. •	Wipe clean again with paper towels. You’re ready to go. 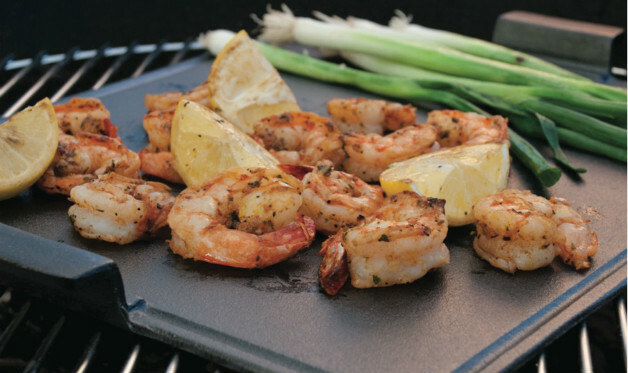 •	After cooking on your plancha, cleaning is easy. While still screaming hot, pour a cup of water over the plancha and scrub it with your grill brush as the water evaporates. Repeat as necessary until the plancha is clean. •	Now drizzle 1 to 2 tablespoons vegetable oil on the hot plancha and wipe it over and into the metal with a tightly folded paper towel held at the end of your tongs. •	Store your plancha in a dry place between uses. Repeat the above whenever the plancha needs re-seasoning.